Amelia, one of the Help Refugees team, is currently visiting our partner projects in Greece. 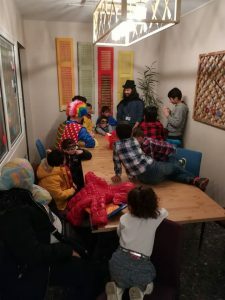 She is writing a series of updates from the trip – you can read about her first day in Thessaloniki here – and this piece provides an insight in to some of our partners’ wonderful work in Northern Greece. Updates from Athens and Lesvos to follow! Over the past few days, our partners’ innovative projects have continued to amaze me. As I mentioned in my last post, Thessaloniki and the surrounding region is a real hub of activity, and it has been a privilege to learn about the amazing work of groups operating in the region. On Tuesday, I visited Irida, a new multicultural women’s centre in Thessaloniki that is managed by our partners, Intervolve. The word ‘irida’ is Greek, and means ‘spectrum’, or every shade of colour that comes together to form light. It was chosen to reflect the diversity of women who are part of the centre’s community, and places inclusion right at its heart. The space is spread over three floors, each of which has various rooms with different purposes. The first has the entry foyer (with a beautiful, Irida sign in the colours of the rainbow), a computer room, offices (for advice and support), a kitchen – where the women can prepare food, or attend the weekly cooking class – and a beautiful terrace that overlooks the city below. The second has a women’s only space, with an infants’ corner, a counselling room, a meditation room, a beauty space, and a sewing room. On the top floor, there is an activity room – it has a mirror, like a dance studio, and will be used for dance and yoga classes – as well as a classroom, a kids’ games room and a kids’ project room! Beyond language classes for English and Greek, the centre will offer a range of practical courses – including breastfeeding tips, conflict resolution and life-skills (such as orientation). You can see the incredible, jam-packed timetable here. The space is beautiful: many of the decorations use repurposed items from the previous women’s centre, in the now-closed Softex camp. Think metal fan casings repurposed as lampshades, wooden shutters painted and hung on the walls (see picture below), plywood being used to create a light feature in the shape of an aeroplane for the kids’ space…and all of this has been created by Mahmoud, one of the volunteers at the centre. His carpentry skills (which you can see here) are evident in every room, including the rocking horse in the infants’ space! I had the pleasure of meeting Lamya, one of the centre’s coordinators. As well as treating me to a tour of the women’s centre and explaining the services offered, we spoke at length about an upcoming project of hers. Voices of Softex is an event that will take place in a few months, as an exhibition and discussion space. It will focus on the experiences of those who resided in the notorious Softex camp, and the lessons that have been – or should be – learnt from the camp’s existence and closure. Underpinning the event is the idea that “the key to building the future is acknowledging the past”: it will ensure that the suffering of those who lived in Softex will not be swept under the rug, or (hopefully) repeated. You can follow the Irida page for updates about the project. The following day, I visited the Thessaloniki Solidarity Centre, managed by Solidarity Now. It provides a combination of social support services, legal assistance, and educational or employment programs – and is used by people from more than 26 countries. It has social spaces (including the UNICEF corner, for young children, and a youth zone), as well as a computer room, several offices and classrooms. The programs available include language courses, which will hopefully be integrated in to an accredited interpreters’ course, as well as CV workshops and advice on job-searching. The focus this year is on education and employability, in recognition of the need for long-term and inclusive strategies. The Solidarity Centre has an additional room that is dedicated to Skype calls, which form an essential part of the asylum procedure in Greece. In brief, those who want to seek asylum in Greece often have a Skype call with the asylum service, rather than attending an office – due to the scarcity of appointments – but must do so within a specific time slot. There is only one hour per week, for example, when the Skype service has an Urdu translator. Consequently, many of the Pakistani asylum seekers in Greece find it practically impossible to secure an interview – yet without it, they cannot proceed with their application. The same is true for Sorani speakers. Having a space allocated to these calls is thus indispensable for beneficiaries’ access to the official system – and without a formal application, their undocumented status puts them at risk of service denial and detention. 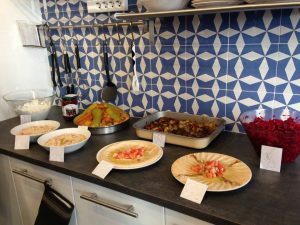 Both Irida and The Solidarity Centre are based in Thessaloniki, and provide indispensable support to the newcomers living in the city. Not only do they provide vital community spaces, but they also ensure that refugees and asylum seekers are empowered and supported, in a holistic sense, to start their next chapter in Greece. Later today, I’ll visit our wonderful partners Omnes, who provide an inclusive housing program in the small city of Kilkis. For now, though, I hope this has given you an idea of the communal spaces created by our wonderful partners – and will write again soon. Help Refugees’ first shipment of aid went to Greece, and it remains a crucial site of our work. Follow the links to find out more about volunteering, or how to donate – we can’t do what we do, without people like you. Thank you.